age from the 4th to the 7th century AD, this military installation was reinforced by the construction of massive fortification walls including massive towers. 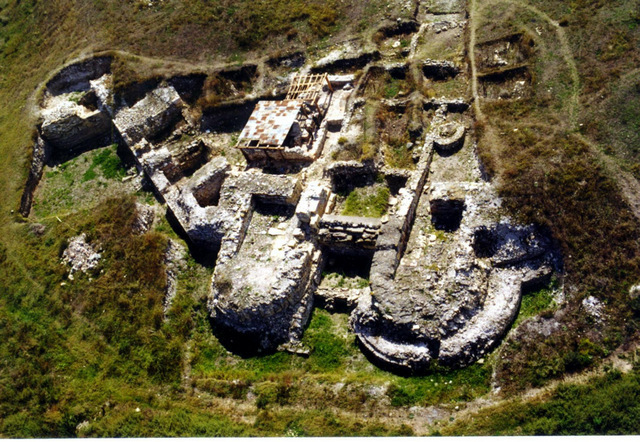 Inside the fort a central building (principia), a bath house (thermae) and a Christian basilica was found, which include the tomb with bones of the first Christian martyrs of Dobroudja, Epictet and Astion (290 AD). At the beginning of the 2nd century AD the fort intended to host a naval force terminus. Later the fort became the headquarters of a cavalry unit controlled by the 1st Iovia Scythica legion. During that period, Halmyris was mentioned by Philostorgios, Procopius and by Hierocles. The Notitia Episcopatuum (592 AD) attested it as an Episcopal centre.